I love coming home the smell of slow cooker meals. Cold nights are instantly better with a few Christmas lights and a bowl of soup ready within 5 minutes of walking in the door. My latest issue of Clean Eating magazine had a recipe I had to try. The part that I changed was the “chunky” part. I like my soups with a more cohesive consistency. I cut the vegetables into smaller pieces and added 2 cans of chicken broth to the crockpot. I exchanged the raw tomatoes for a can of diced tomatoes with the juice. This is what was waiting for me tonight. To a 5-qt slow cooker, add onion, bell pepper, garlic, and chipotle chiles. Stir to combine. Top with potatoes and cans of tomatoes and beans. Gently remove chicken from slow cooker. Turn off heat and let stand, uncovered, for 15 minutes to absorb flavors and thicken slightly. (NOTE: Do not stir as vegetables are tender.) 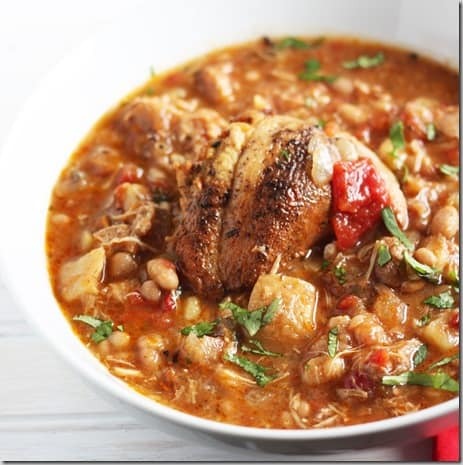 Debone chicken in small pieces and return to crock pot. Gently fold together. Sprinkle with salt and cilantro and serve with lime wedges. I made this soup last week and it was so delicious. I used a combination of sweet potatoes and regular potatoes, and added some kale, too. Thanks for sharing! Great!! I’m glad you liked it! Now that I’m moving to a more paleo diet, when I make this, I’ll use sweet potatoes. I’m glad to know they work with this recipe. Lately, I’m adding kale to EVERYTHING! Thanks for the ideas for this. I was surprised to learn that the brand of chipotles carried in my local store had gluten. Check the ingredients.